We offer a range of rental cameras, both still and motion. We also offer a digital photo downloading service. Capture the memories of your underwater adventures, and we will transfer the footage on a DVD for you to keep and show to friends and family. Join us on one of our dive trips and and we’ll help you understand more about the art of underwater photography and videography. Being “on location” means we can offer very reasonably priced courses and clinics. A course results in a PADI qualification, a clinic is less formal and tailored. We cater for all levels from the complete beginner wishing to rent a camera and housing to the advanced photographer with his own equipment wishing to tap into our knowledge to receive tips and techniques. The Canon G15 with underwater housing WP-DC48: a 12 megapixel sub-DSLR with a range of pre-sets and manual functions for precise controls. We also have a GoPro Hero3+ Black Edition (also boast 12MB photos) for rent. Rental Fee (Canon G15): MYR225** – Photos are downloaded to CDROM. Rental Fee (GoPro): MYR210** – Photos are downloaded to a USB thumbdrive. Get the most out of your own underwater equipment or practice with ours! 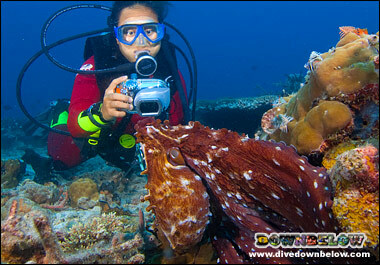 Whatever level of diver or photographer we can tailor a photo or video clinic to suit. The length of the program also depends on you. Our clinics incorporate dry sessions and open water dives to meet individual requirements. Digital has taken the underwater photography world by storm. With the PADI Digital Underwater Photographer Specialty course you can quickly and easily capture the underwater world with your camera and on your computer. This is one of PADI’s most adaptable specialty courses, and can even be started during the last dive of your PADI Open Water Diver course. The certification credits toward the Master Scuba Diver rating. During the PADI Digital Underwater Photographer Specialty course, you learn the PADI SEA (Shoot, Examine and Adjust) method, which takes full advantage of digital technology. The result is good underwater photos faster than you may imagine. You not only learn how to take good photos, but how to share them with your friends via email or printing, optimizing your work with your computer, you also learn about choosing modern digital cameras and underwater housings. 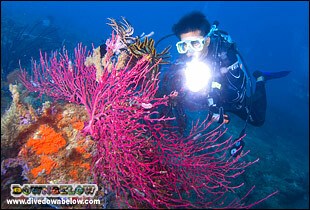 For more information please visit PADI courses and Digital Underwater Photography Course information. Freeze time with an underwater camera and you tell a story that even non-divers can understand. Not only that, but you have a record and log of your adventures – more than the memories. Reliving a dive is as simple as looking at a photograph. Whether you’re a casual holiday snapper or a consummate photo pro, the PADI Underwater Photographer course teaches you the basics. They will apply to taking photos underwater with a special emphasis on practical technique.